ab26005 recognises CD55 antigen (Decay accelerating factor). Tissue/ cell preparation (Human) -T cell line HPB-ALL. This antibody recognizes an epitope in SCR4 domain of CD55 antigen. Our Abpromise guarantee covers the use of ab26005 in the following tested applications. Expressed on the plasma membranes of all cell types that are in intimate contact with plasma complement proteins. It is also found on the surfaces of epithelial cells lining extracellular compartments, and variants of the molecule are present in body fluids and in extracellular matrix. Contains 4 Sushi (CCP/SCR) domains. The first Sushi domain (SCR1) is not necessary for function. SCR2 and SCR4 provide the proper conformation for the active site on SCR3. The Ser/Thr-rich domain is heavily O-glycosylated. 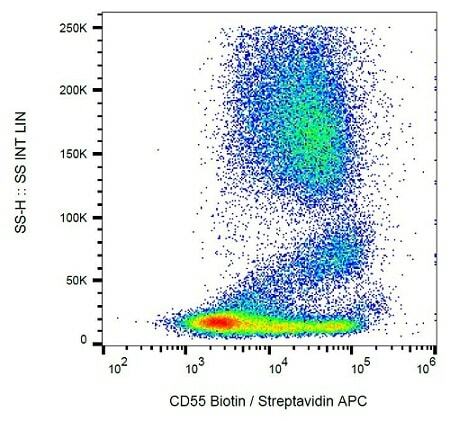 Surface staining of human peripheral blood cells with anti-CD55 (MEM-118) biotin / streptavidin-APC. ab26005 has not yet been referenced specifically in any publications. Publishing research using ab26005? Please let us know so that we can cite the reference in this datasheet. There are currently no Customer reviews or Questions for ab26005.